Lookout Mountain is a vast and beautiful place─ the Mountain itself as well as the valleys and streams it encompasses. Lookout Mountain, the Southern terminus of the Cumberland Plateau, is a critically imperiled region representing both the world’s most biologically diverse freshwater ecosystem and one of the world’s most biologically diverse temperate forests. Lookout Mountain Conservancy's large service area demanded we plan strategically to address the land, water, conservation and recreational initiatives that mattered to our community. Our strategic planning process revealed five focus areas spanning Lookout Mountain. In each of these geographic areas we are working to create healthy land, clean water and stronger communities -- both human communities, developing next generation conservation leaders and natural communities, protecting wildlife habitat such as the green salamander and American Bald Eagle. Parks owned and managed by community organizations such as Ruby Falls, Rock City, and Point Park. 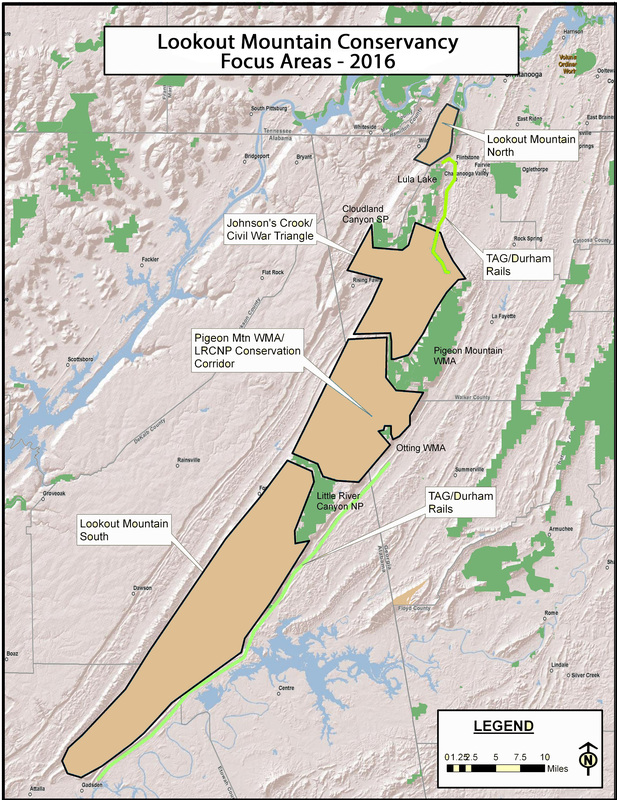 Focused on the west and south sides of Lookout Mountain, where communities and/or landowners will be conserving locally important farms and forests, wildlife habitat and natural and cultural resources. Includes: land west and south of Little River Canyon National Preserve through the southern terminus near Gadsden, Alabama.